After my blowup at Wildflower, I made a list of goals that I’d need to strive toward if I want to approach my goal of setting a 70.3 PR and hopefully breaking 5:30 at Vineman in July. One of those was to eliminate dairy indefinitely – ice cream, post workout pizza, and fro yo included. When I posted back on May 8, I noted that the short term impact of eliminating dairy (for roughly a week at that point) was staggering. Now that I’m 3+ weeks detached from delectable dairy indulgence, the results are hard to believe: I’m almost 15 pounds lighter. 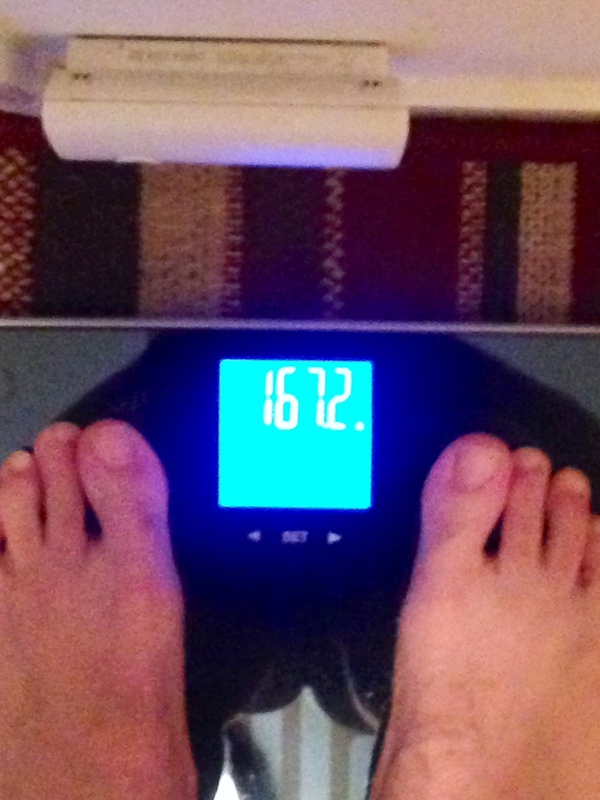 I tipped the scales at 167.2 pounds this morning – and the .2 very well could have been my iPhone. This is officially the lowest weight I can recall – at the peak of my weight loss during Ironman training in 2012, I dipped down to 168 pounds. It’s important to note that the only thing that’s changed in my diet is the elimination of dairy. For those of you who’re wondering, I’m still eating treats – plenty of treats, drinking beer (in moderation) and otherwise eating roughly 80% clean. It really reinforces the fact that Lactaid lulled me into a false sense of security – I’m allergic to dairy and a magic pill won’t necessarily cure me. My leaner frame is already translating to a lower rate of perceived exertion during my runs and bike rides and I’m charging toward an improved power to weight ratio at the perfect time. I’ll post a recap of my progress toward hitting the other goals I set after Wildflower in the upcoming weeks, but until then, pass the sorbet. Wow what a big change in just cutting dairy. I don’t think I’ll ever see that weight, other than when i was 15 maybe. At 6’7″ it wouldn’t even be healthy. 6’7″ is so tall! You must get a lot of comments on your height. You have No idea! I’ve been used to it my whole life though. It’s just something you get acclimated to. LOL – cutting out ice cream is cruel! I noticed the same thing when I cut out dairy! I’ve been back sliding a bit….cheese and ice cream are too tempting for me to resist – but still eat very little. Awesome job on the 15 lb weight loss! I’ve been thinking of eliminating/reducing dairy for a while now, but it’s hard for me to do because it would leave me without a lot of the staples in my diet. Now 15 pounds in 3 weeks would definitely make me reconsider. After some GI issues in 2009, I saw a GI specialist who later confirmed that I’m lactose intolerant. I cut out dairy cold turkey and abstained for a better part of 4 years – except for an occasional ice cream, pizza or fro yo. I started taking lactaid and eating dairy with low/zero milkfat – mostly greek yogurt, when Taylor and I moved in together last year. In late April/early May, I was feeling abnormally sluggish and also experiencing GI issues during long workouts. I reverted to zero dairy to see if it would impact my training. Since cutting dairy, I’ve lost mostly water weight and my GI issues have definitely subsided. Take this all with a grain of salt. If you’re curious, you could always cut your intake for a few days or a week and see if you notice any improvement. Good luck! Thank you so much for the info, and for sharing. I will try it out, it’s hard for me because I’m too used to eating cheese and drinking milk, but I’ll figure out alternatives for a few days so I can give it a try, and see how it affects me. Whoa, that’s crazy! I know I feel a ton better when I cut out dairy. Good thing sorbet is delicious! It sure is 🙂 Mango’s my favorite.